“Sarasota Jazz Project” is a high energy 17 piece jazz ensemble comprised of some of the finest musicians on the West Coast of Florida. These talented all-stars play both original compositions and standard tunes, creatively arranged in a unique contemporary Big Band style. Whether you dance or listen or both, be prepared to be thoroughly entertained. The Sarasota Jazz Project Big Band performs at jazz concerts, clubs, schools/universities, private clubs, and Jazz Club of Sarasota events throughout the year. 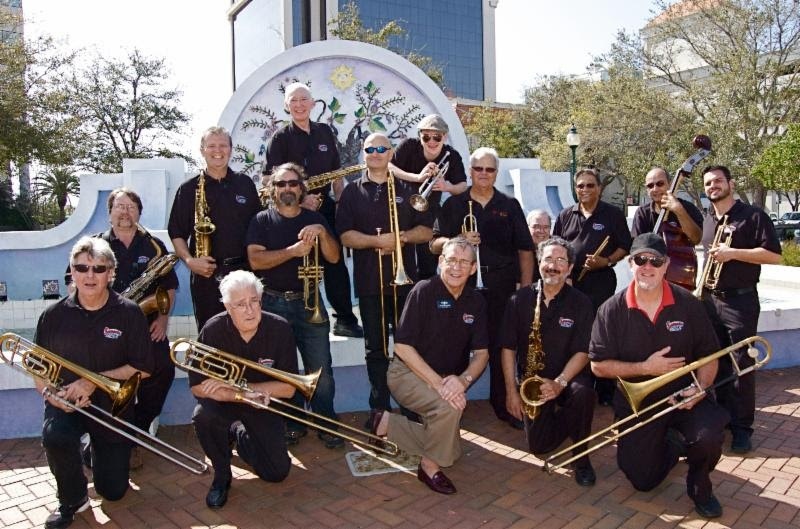 The Sarasota Jazz Project is a seventeen-piece Big Band dedicated to the preservation, promotion, and public performance of big band jazz music in Sarasota and the neighboring communities in the state of Florida. Founded in February 2010 by George McLean and George McLain (no relation! ), the band is comprised of the best available local musicians, including professional jazz musicians with long resumes and careers in performing with top-name bands and jazz musicians throughout the world. Members also include local music teachers and educators; working musicians who perform regularly in local theaters, orchestras, and cabaret venues; and other serious local musicians who maintain “day jobs” and play jazz for the sheer pleasure and exhilaration of being a part of this truly American art form.